Some shots are a result of being in the right place at the right time – and this was one of them. This young bull elephant is not charging me, he has just finished making his way carefully down a rocky slope, and has skidded down the last few feet, sending the dry season dust billowing into the air. But in getting to “the right place” required rather a lot of time, patience and intricate knowledge of both the desert and the elephants’ behaviour. This is a desert-adapted elephant found in the bleak expanse of Damaraland (also known as the Kunene) in northwestern Namibia, and we had spent the morning tracking them, following footprints and droppings up and down dried-up riverbeds. Desert-adapted elephants are not a distinct species to the more common savannah elephant. But they have, as their name implies, developed some unusual characteristics which allow them to survive the long droughts in this inhospitable region. African elephants are notorious for causing widespread destruction – smashing their way through vegetation and fencing as they trek across the savannah in search of food. But the desert elephants are extraordinarily careful of their environment, and avoid snapping branches and trampling bushes, most likely as a result of their scarcity and therefore their value in the desert. The lack of water sources in Damaraland means that the elephants travel up to 60km a day in order to drink, and sometimes resort to digging for water with their tusks. The herd’s home range can cover an enormous 2-3,000 square kilometres, and their feet have become larger to facilitate walking these huge distances over the soft Namibian sand. While their savannah cousins usually drink each day, the Damaraland residents can wait four days before quenching their thirst. 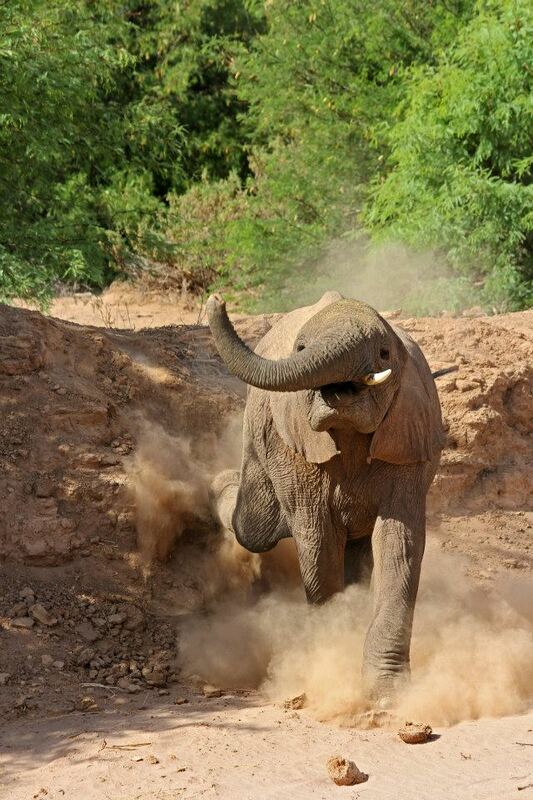 Many operators in Namibia offer desert-elephant tracking tours in Damaraland. I travelled with Ultimate Safaris. Be aware that these are wild animals which travel great distances, and sightings are never guaranteed. Your driver should not get too close to the herd, and should move away if any animals show signs of distress. Never exit the vehicle when in the presence of elephants, and make sure you have a clear 360 degree view when you do – even though the elephants are huge, they can be surprisingly well hidden behind bushes! Joint Venture lodges are partnerships between the local community and Wilderness Safaris. These beautify, environmentally friendly lodges stand on community-owned land and employ local staff, boosting employment and incomes in this rural area. Excellent examples of JV lodges are Damaraland Camp and Doro !Nawas. Elephant Human Relations Aid (EHRA) is a non-profit dedicated to resolving conflict between elephant and human populations living side by side in Damaraland. Read more about them, and how you can donate to this charity or volunteer on an elephant project here. Note: This is not a sponsored post. All views expressed are my own. Tags: adaptation, africa, Damaraland, desert, elephant, Kunene, namibia, safari, tracking, wildlife. Bookmark the permalink.